Maria Christina' s house. Your beachfront place. 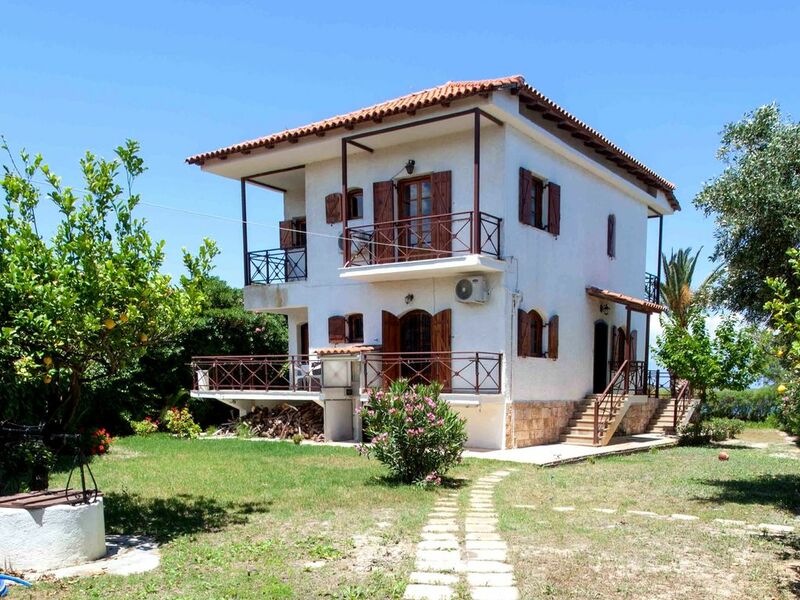 The house is a two and a half floor building, surrounding by a beautiful garden with a BBQ, right in front on a quiet beach, one hour and 15 minutes by car from Athens. The place is a small piece of paradise, for splendid holidays for you, your family and friends. It should be considered for winter vacations also (up to 12 persons during winter season). Besides the two fire places and central heating, the mountainous village Trikala is only 30 minutes away by car, and the ski center of Zeiria 35 minutes away. The ground floor comprises a living room, one bedroom with a double bed (144 x 194 cm), a bathroom and a kitchen. Each room has its own balcony, with a spectacular view. Especially from the front balcony one enjoys the garden view, the sea view and beyond, reaching to the Parnassos mountain. The first floor has two bedrooms, one with a double bed (140 x 214 cm) with a spectacular sea view, the other with a double bed (140 x 218 cm) and a single bed (90 x 190 cm), a bathroom and a living room connected with a small kitchen. As you can see from the photos, this second living room may be used as a separate bedroom with two single beds (90 x 185 cm and 86 x 195 cm). The half-ground floor has an independent entrance, hosts the most spacious bedroom of the house and includes a bathroom with a shower. It used to be the guestroom of the house or the playroom for the children, with two single beds (90 x 190 cm each) and a sofa bed (it is transformed in a double bed 140 x 186 cm). All bedrooms are air-conditioned except the half-ground one since it is inherently cool even during the hot summer days. The main kitchen of the house is fully equipped with four with an electric oven, a refrigerator, a dishwasher, a microwave oven, a toaster, a coffee maker and everything else you need, to prepare and enjoy your meals. The smaller kitchen of the house is equipped with a small cooking unit, a small refrigerator and a coffee maker. All three bathrooms of the house offer amenities as bath foam, shampoo, conditioner and body milk. Also the house has a camp bed and a baby coat. In the garden of the house there is parking space for three cars and a BBQ as well. Additonal appliances: 3 TV sets, WiFi, sun umbrellas and sun beds. Α “hidden” beauty of the place is the clear starry sky. Away for the city lights, in a clean atmosphere, the house balcony is a window to constellations and the galaxy light. Moreover the moon rise is spectacular when it is getting full, as well as the sunrise for those who are early morning types. In 150m from the house there is a beautiful coffee bar, named “Navarino”. There you can find tasteful coffees and sweets, and you can have light meals. The house is two minutes by car, from Xylokastro, a seaside small town famous for its pine forest on the beach, call Pefkias. Pefkias is a thin strip of natural pinewoods, at an area of 60.875 acres, which includes 83 different species of the Greek flora, and it has been characterized as an aesthetic forest. In Xylokastro you can find many restaurants, fish taverns, bars, two summer cinemas, and a wonderful cycle path next to the sea side. By train: 80 minutes from Athens "E. Venizelos" airport to the town of Kiato, 10 km away from Xylokastro. By bus: Frequent (every 60 minutes) departures from Athens Peloponnese bus station to Xylokastro and vice versa. Trip duration is 90 minutes. We had a wonderful time a María Christina’s home. She was very gracious sharing her beautiful home on the sea with us! Everything was perfect! Our group of 8 had plenty of room and the view was stunning! Perfectly located house on the beach !!!! We have a perfect time, your house is gorgeous and magnificent and the beach just behind the door is extremely wonderful. We have never been in such a wonderful place on any our vacation before. And we have plenty of fun in the sea with your boat (unfortunately a little drowning, but still fun ;-). We have felt there the atmosphere of a loving family, your house is equipped with everything (from washing liquid, pharmaceutics, to tennis rockets... everything). Wonderful place for staying ! It is only one and a half hours to get from the center of Athens to this amazing location with the sea in front of the door of the house. I have spent many summers in this house and the first thought that comes to me is relaxation. The house is made entirely of stone and wood with a garden with a lawn that ends on the beach without the road to pass from the front, making it ideal for a family with young children. The view and the air of the sea from the veranda of the house, make you not to want to leave home at all. Less than a 5-minute drive is Xylokastro for shopping and walking to its shops. All the above ψombined with the hospitality of the owners, promise a wonderful staying ! The house is spatious, comfortable and very functional. The appliances are in good shape – nothing is missing. The whole family, four of us, spent five days there and loved the place. The front terrace is a real joy and so does the balcony of the upper floor. The view to the sea and the distant mountains is a way to the ultimate relaxation. The beach is practically private and it feels like you can jump from the bead directly into it – well, you have to walk through the beautiful garden. What I enjoyed the most was the quality of sleep and the early morning coffee drinking in the upper balcony. La maison était conforme à nos attentes, très confortable, spacieuse et fonctionnelle. Nous avons passé une très belle semaine en famille pour Noël, la maison est très agréable face à la mer. ... ob man sich in einem Haus wohlfühlen kann, in welchem offensichtlich die Familie seit geraumer Zeit viele Einrichtungsgegenstände aus verschiedenen Epochen, inklusive Geschirr, Besteck etc sammelt. Natürlich mag es der Inhaberin oder dem Inhaber schwer fallen, sich von solchen Dingen zu trennen. Für uns als Urlauber macht es den Eindruck eines Haushaltes im Beginn eines 'Messi'-Zustandes. Wir hatten dieses Haus ursprünglich für weitere 3 Monate im Sommer 2019 gebucht, haben davon aber Abstand genommen. Was uns in diesem Zusammenhang ebenfalls gewundert hat ist, dass vor dem Hintergrund, dass wir bereit waren insgesamt einen stolzen, 5-stelligen Euro-Betrag auszugeben, bei der Schlüsselübergabe durch die Agentur erst einmal alle Fensterläden geöffnet werden mussten und weitere Mängel festgestellt wurden. Das Haus und der Garten hatten unter dem Medicane der vergangenen Woche gelitten - da ist jeder machtlos und das wird natürlich auch nicht negativ bewertet - dass aber keinerlei Anstalten gemacht wurden, die Feuchtigkeit aus dem Haus zu vertreiben (intensives Lüften hätte sicher den Modergeruch vertrieben), wunderte uns sehr. Auch wurde erst bei Übergabe festgestellt, dass das Licht in der Küche nicht funktioniert. Die Heizung war in der ganzen Woche (es war durchaus kalt in den Nächten Anfang Oktober) nicht funktionstüchtig - wir haben uns dann halt in dem einen oder anderen Raum mit Heizöfen beholfen. Ob Altmetall, ausrangierte Stühle, ein nicht mehr funktionsfähiges Boot u.ä. im Garten toleriert werden müssen, lässt sich diskutieren, ebenso wie diverse Putzmittel, die über die Terrassen verteilt sind. Insgesamt haben wir uns nicht recht wohl gefühlt, obwohl die Kommunikation mit Maria vor, während und nach unserem Aufenthalt immer zügig und professionell war. Letztlich noch die Empfehlung, die Bilder des Angebotes der Realität anzupassen, denn die beiden Palmen sind inzwischen einer grassierenden Krankheit zum Opfer gefallen. Es stehen nur noch traurige Stümpfe. Wir sind in der Woche viel herumgereist um eine Alternative für die drei Monate im Sommer 2019 zu finden, welche wir auch gefunden haben. Dabei haben wir noch wesentlich schlechtere Angebote gesehen. Vielleicht sind Häuser dieser Größe halt oft ehemalige Familiendomizile in denen sich in Haus und Garten über Generationen verschiedenes ansammelt, ohne dass es auf einen Standard für professionelle Vermietung gebracht wird. I am sorry that you didn’t enjoy your stay at Maria-Christina’s house. However, you were notified that the house and the surroundings were not at their best due to the severe floods that hit the area. As a matter of fact, I offered you the option to cancel your visit with full refund. It is the first time that I receive comments about the “mixture” of various things, including dishes. However, I followed your recommendation in an earlier message and replaced the dishes and the glasses with a uniform set, including the wine glasses. It is a pity that the palm trees are gone. That was a recent development; the photos will be updated. I wish you the best for your upcoming summer vacations in Greece.